Our Agribild® product is already Ireland's most popular roofing and cladding product for animal housing and farm buildings. The product comes with an extended guarantee period of 20 years offering the farmer the longest guaranteed protection for metal roofing and cladding in the Irish market. Colorgalv®is our low cost roofing and cladding product for low-humidity farm buildings used for non-animal applications such as general storage, grain storage etc. Colorgalv® is protected by a zinc coating, a double layer of primer plus polyester coatings and is offered in two profiles and three colours. 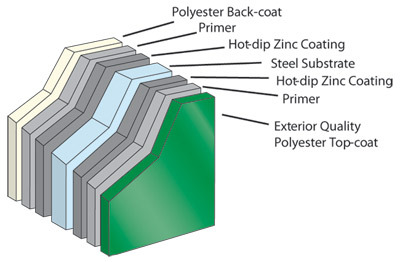 Colorvent® vented sheeting is also available.